Famed Charles Manson prosecutor and three-time #1 New York Times bestselling author Vincent Bugliosi has written the most powerful, explosive, and thought-provoking book of his storied career. 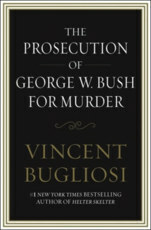 In The Prosecution of George W. Bush for Murder, Bugliosi presents a tight, meticulously researched legal case that puts George W. Bush on trial in an American courtroom for the murder of nearly 4,000 American soldiers fighting the war in Iraq. Bugliosi sets forth the legal architecture and incontrovertible evidence that President Bush took this nation to war in Iraq under false pretenses -- a war that has not only caused the deaths of American soldiers but also over 100,000 innocent Iraqi men, women, and children; cost the United States over one trillion dollars thus far with no end in sight; and alienated many American allies in the Western world. A searing indictment of the President and his administration, The Prosecution of George W. Bush for Murder also outlines a legally credible pathway to holding our highest government officials accountable for their actions, thereby creating a framework for future occupants in the oval office.